Hundreds of people mill around the Bhule Bhatke Camp, lost in the teeming crowds of the Kumbh Mela and hoping desperately to be found—a familiar trope of many a Hindi film, but also an everyday reality in the largest gathering on earth underway at Prayagraj. The humble tin settlement that is the headquarters of the camp has already found 20,000 people since the Kumbh Mela started on January 15, said Umesh Tiwari whose father started the lost and found movement. Many writers of the 1960s and 1970s shot to fame by penning stories themed on separation in the Kumbh Mela and unification several celluloid hours later. But it was Raja Ram Tiwari, famously known as Bhule Bhatke Tiwari, who gave real life to their stories. He dedicated 70 years of his life to help reunite "12,50,000 adults" and over "20,000 children" lost in Kumbh with their families, said his proud son. Tiwari Senior's success rate was close to "100 per cent", he added. And unlike the movies, a child did not have to wait for 20 years to meet his or her parents or siblings. "Sometimes it could take days and sometime it was just matter of some hours. My father, in most cases, did manage to reunite lost people with their families. When he couldn't help the lost person, he would take the help of police," Umesh said. The formula for success, devised way back in 1946, continues in this digital age with loudspeakers blaring out the names of those queuing up outside and inside the camp. The rudimentary camp, set up in Triveni Marg of the Mela grounds, is furnished with just a few chairs and tables. It's basic but effective, said Umesh, happy to back age-old methods of locating the 'bhule bhatke' in the mela rooted in tradition that goes back thousands of years. For Raja Ram, it all started when he attended the Magh Mela, an annual fair on the banks of the Sangam at Allahabad, in 1946 with his friends, recounted the son who carries on his father's work. "In that mela he saw an old woman crying. He asked why and learnt that she was lost. After three hours, he found her home. That incident made my father very happy. "The next day, he came again and started announcing the names of lost people with a handmade tin loudspeaker. He would move around the whole mela with a caravan of lost people following him. That year alone, he helped reunite 800 people," Umesh said. There has been no looking back since. Raja Ram participated in six Ardh Kumbh Melas, six Kumbh Melas and over 60 Magh Melas in Allahabad. When he died in August 2016, at the age of 88, he passed on the baton to his son Umesh, who now heads the Bhartiya Seva Dal— the organisation running the Bhule Bhatke camp. The youngest among Raja Ram's four sons, Umesh has been helping his father since he completed his graduation in 1995 from Allahabad University. "Bhule Bhatke toh humare khoon mein hai bhai sahab (Bhule Bhatke runs in our blood, brother)," said Umesh, who when not re-uniting people in Melas works as a farmer. Cool as cucumber, 43-year-old Umesh is a genial fellow who welcomes everyone entering the tin shelter set up. There's a woman from Jammu and another from Jharkhand who have been separated from their groups. Umesh gave a patient hearing to both before making the announcements. "Mata ji aap parchi mein sab likhwa dijiye, aapka anouncement kar denge. Ganga maiya sab theek karegi (Please write your names on paper. Your announcements will be made. 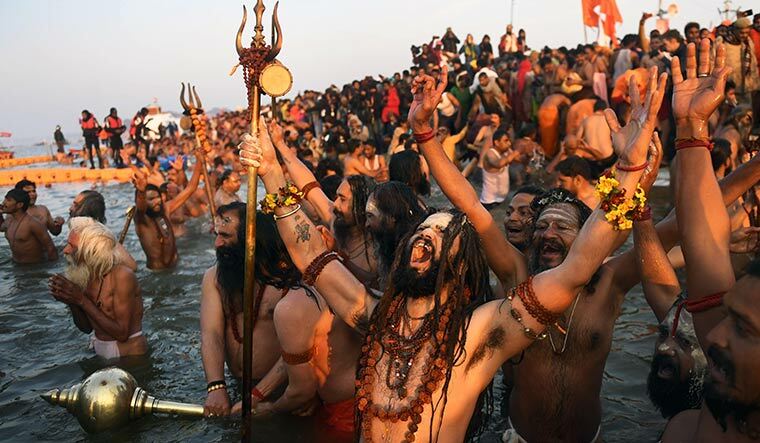 Mother Ganga will set everything right)," he told the visitors gently. The personal touch is perhaps why Bhule Bhatke still holds its own despite 15 digital lost-and-found centres. "Modi's ji slogan is 'Chalo Kumbh Chale', mine is 'Wapsi Ghar Surakshit'. Yes, we use traditional methods only and we plan to stick with it. However, I welcome the inclusion of the hi-tech lost-and found centres this time. Hope they get to help and serve the people better," he added. There's absolutely no money involved. In fact, even a cup of tea from their money is not acceptable, said Umesh. "They are our guests till the time we help them find their relatives. When it is done, we request them to leave and make way for our other guests. The only thing we ask from them when they leave is permission to take their smiling photo and one loud chant in the praise of 'Ganga Maiya'," he added. There's a trace of regret that the governments through the years have done little to recognise the contribution of his father. "People from different countries come here and talk highly about my father. They take interviews, make documentaries ... do so many things. But here, with due respect to everyone, I feel he didn't get the respect he deserved," Umesh said.